BoBoBoBoker tov! Boker tov (good morning) Leviim parents! A lot has happened since last we wrote!! After a busy start everyone was so excited and ready for the first Shabbos of the kayitz (summer). Before Shabbos festivities could begin, the chanichim spent Friday afternoon playing kickball and basketball, as well as meeting with an incredibly talented Sofer (scribe). 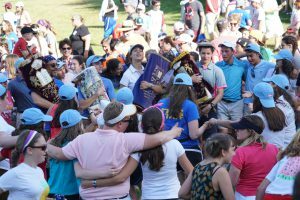 The sofer came this Shabbat to give camp a new Sefer Torah that he has been working on in honor of Debbie, our fearless leader, and her 26th and final year at Yavneh. The Sofer shared his life story with us and also explained the work and rituals of a scribe. When meeting with the banot, he demonstrated the precision, time, and care it takes to write just a single alef. After a quick pre-Shabbos nishnush (snack) the chanichim hurried back to the tzrifim (bunks) to get ready for the exciting night to come! First the camp joined together for a ruach (spirit) filled Relish or ruach lifnei Shabbat (Shabbat singing) and then beautiful Shabbat evening services. Next came a delicious Shabbos dinner with challah and matzo ball soup of course. We ended the night with zmirot (more singing) led by Kerem (Yavneh’s oldest aydah/age group). Saturday morning after davening (prayer) and a coffee cake breakfast, our chanichim spent the morning and afternoon with friends, playing basketball, reading together on the field, and just enjoying being with one another. Just as Shabbat came to an end another holiday quickly took its place. No, not the 4th of July but Debbie Day!! A day to celebrate Yavneh’s Camp Director Debbie Sussman’s 26th and final year at Machaneh Yavneh. The Leviim chanichim worked together to dress up as the most impressive-looking, crime-fighting group of superheroes Yavneh has ever seen!! All of the aydot (age groups) joined together in one huge parade, sang karaoke in the Beit Am (gym), and then danced around and with the new Sefer Torah. At night we listened and danced to Yavneh’s Super Band before watching an amazing firework show. It was truly an unforgettable celebration. Be on the lookout for our next blog post!! Tomorrow we leave for a three-day hiking trip at the Highland center and we could not be more excited!! !